The Torus Power FM series push the limits of available current rating for Toroidal Isolation transformers. Two models are available in ratings of 25KvA and 35KVA. Both units are powered by a Plitron built Toroidal Isolation Transformer offering large scale power isolation and conditioning for high end audio video applications in home theater, 2-channel home audio, professional studios and commercial theaters. 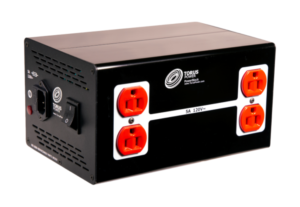 Torus Power Toroidal Isolation Transformers comes in 25kVA, providing complete isolation from the external power grid. Torus Power Isolation Transformers have a low output impedance. The 25kVA can offer high instantaneous output current, each drawing from the service line or sub panel (230V or 240V). Low Source Impedance enhances total system performance. The Torus Floor Mount Series filter noise with Plitron’s Narrow Bandwidth Technology (NBT). 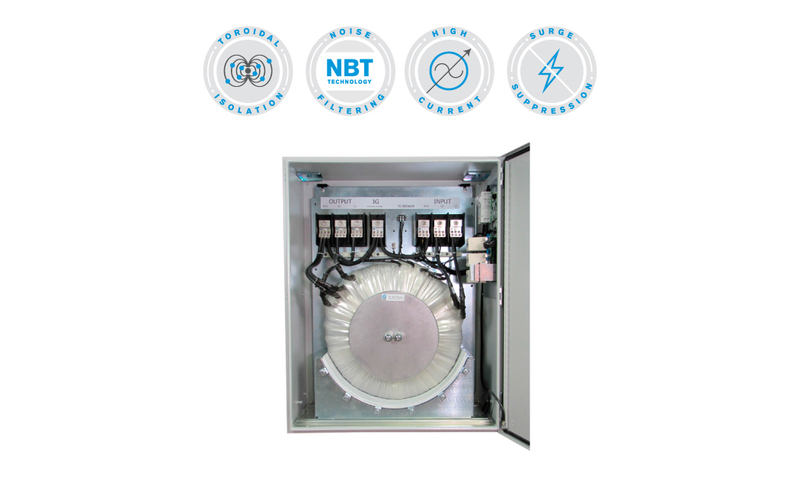 NBT uses controlled leakage inductance and capacitances within the transformer to significantly reduce common mode and differential mode noise. NBT operates from 2kHz to 1MHz at 12dB/decade up to 500kHz. The toroidal transformer operates above 97% efficiency making the Torus Power Isolation Transformer environmentally friendly by minimizing wasted power consumption. Surge Suppression – The Floor Mount Torus Power series has a TVSS device built in to its signal path. This UL certified Panel TVSS has a sub-nanosecond response time and manages surges beyond 20,000 Amps. The TVSS also offers additional noise filtration of EMI and RFI (40dB typical). TVSS is Standard for FM Series. To be fed from disconnect or panel with current limiting.